Lester Carter, Jr., long time noted pharmacist and local institution received an honorary doctoral degree at the Medical College of Wisconsin (MCW) commencement ceremony on May 15. During his acceptance speech, Dr. Carter called on the graduating class to keep an open mind about herbal solutions, pointing out recent scientific evidence that diets high in certain dark green leafy vegetables can interact negatively with certain medications for high blood pressure. The honor comes after a year that would have left most people down for the count. As a young man growing up in Omaha, Dr. Carter learned to box and said the lessons he learned in the ring gave him the confidence to pursue audacious dreams. Dreams which include becoming one of the first African Americans serving in combat as a medic on a Navy troop-landing ship during the Korean War and becoming the first black pharmacist at “the rich pharmacy in Omaha” that served the neighborhood where multi-billionaire Warren Buffet still lives. Throughout his life when others sought to deny him a fair opportunity, he seized it, because of his proficiency, success developing alternative cures and attention to detail. Unfortunately for most of 2014, he was forced to apply that tenacious strength of character to keeping himself alive. One Sunday morning early in that year, Dr. Carter, now 83 years old, awoke with such agonizing hip pain that his wife, Irene, had to call for an ambulance. Since his children had moved out 15 years ago, he and his wife lived above the store. Because the aisles in the store were so narrow, the Emergency Medical Technicians could not use a gurney and had to carry him out in a body bag. The rumor circulated through the neighborhood that he had died. 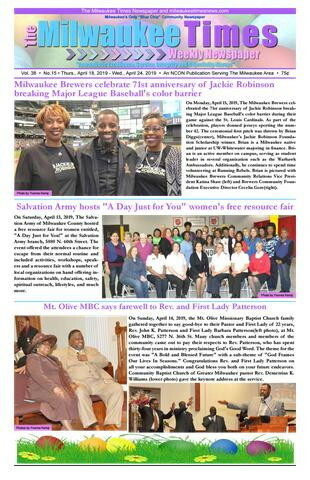 Instead he endured two hip replacement surgeries, surgery for colon cancer and for cataracts in both eyes. He also had surgery to fuse two vertebrae in his neck. During his year-long bout with health problems, Irene was diagnosed with lung cancer and died in October. Although he sold the store to Hayat Pharmacy in March 2014 and now lives in St. Francis with his daughter, in February he returned to work. He now works about 20 hours, four days a week for Hayat Pharmacy, the company to whom he sold his business. Mr. Zaibak, the majority owner of Hayat Pharmacy, was born in Palestine. 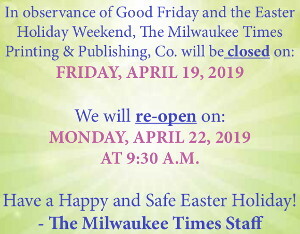 He has lived in the U.S. for 20 years and after working for CVS Pharmacy for 12 years, he opened his first pharmacy in Milwaukee at 3727 W. Wisconsin Ave., in August 2011. All six of his stores are located in the central city. After Mr. Zaibak bought Dr. Carter’s Pharmacy, he moved the prescription part of the business to 1919 W. North Ave. 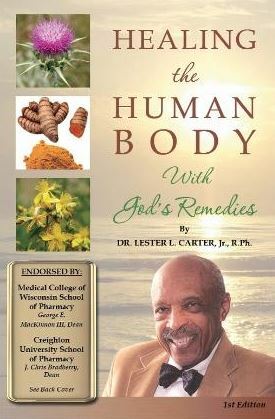 The herbal supplements and over-the-counter medications continue to be sold at Dr. Carter’s original location. They have even kept the store name. Dr. Carter came to Milwaukee somewhat impulsively in 1964 after a friend insisted he had to come to Milwaukee. By the time he left Omaha, he was in charge of the pharmacy where he first began his medical-school internship by sweeping the floor and making milkshakes. 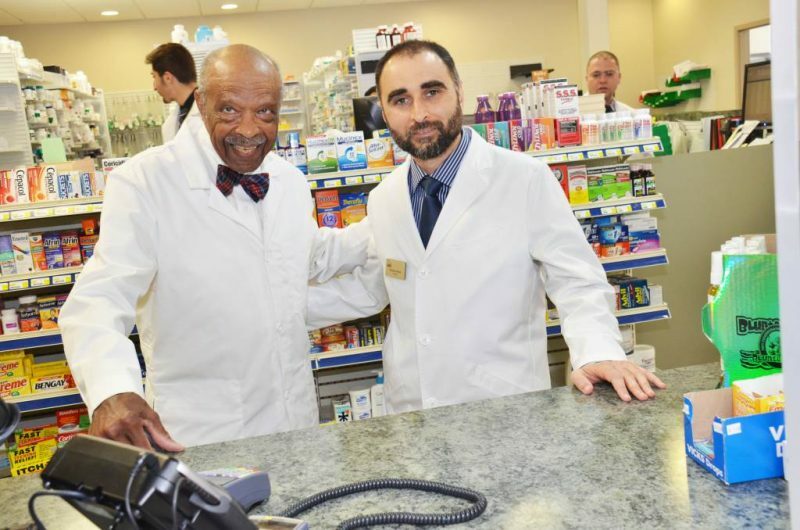 When he first purchased Carter Pharmacy in 1968, the neighborhood population was primarily German American and initially there was some hesitation among some existing customers about having an African American for a pharmacist. His partner and the man from who he had pur- chased the store advised him to stand up straight, look each customer directly in the eye and wish them good morning in German. “That worked just fine,” Dr. Carter said chuckling. In all the years that he ran the pharmacy Dr. Carter said the store never suffered a robbery and shoplifting was something he dealt with personally without involving the police. “The one thing that I made mandatory at the beginning was that everyone was treat- ed with courtesy and respect whether they were one year old or 100,” he said. His one regret is that he no longer lives in his former neighborhood. “It’s the best neighborhood in the state,” he said.